Drag-and-drop file sharing menu bar app. Is there a better alternative to Nimbus? Is Nimbus really the best app in Productivity category? Will Nimbus work good on macOS 10.13.4? 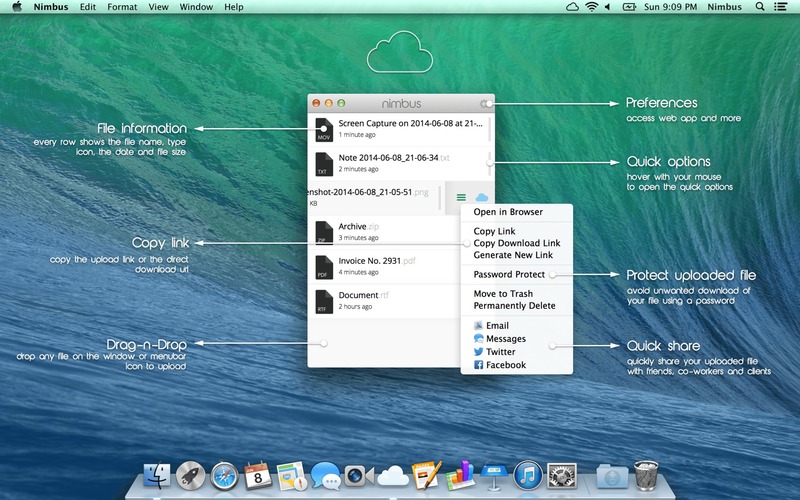 Nimbus is a file sharing app for the Mac. Nimbus makes sharing images, videos, music, documents, screenshots and screen recordings as simple as drag and drop over the menubar or the Nimbus window. A link will be automatically generated and copied to your clipboard, which you can then share with friends, co-workers or clients. The advantage of Nimbus over other apps like it is that you are in complete control of the sharing server. Create unlimited users, set the quota and upload limitations, manage download page banners and analyze views and clicks reports. Download the server application from http://getnimbus.com. Nimbus needs a rating. Be the first to rate this app and get the discussion started! For more information about Nimbus or how to download and install the server please visit http://getnimbus.com. Nimbus for mobile devices soon.